On our vacation this year, we took a cruise to South America. We knew there would be several days “at sea” as we traveled. And on days at sea, Park West, the on ship’s art gallery has art auctions. 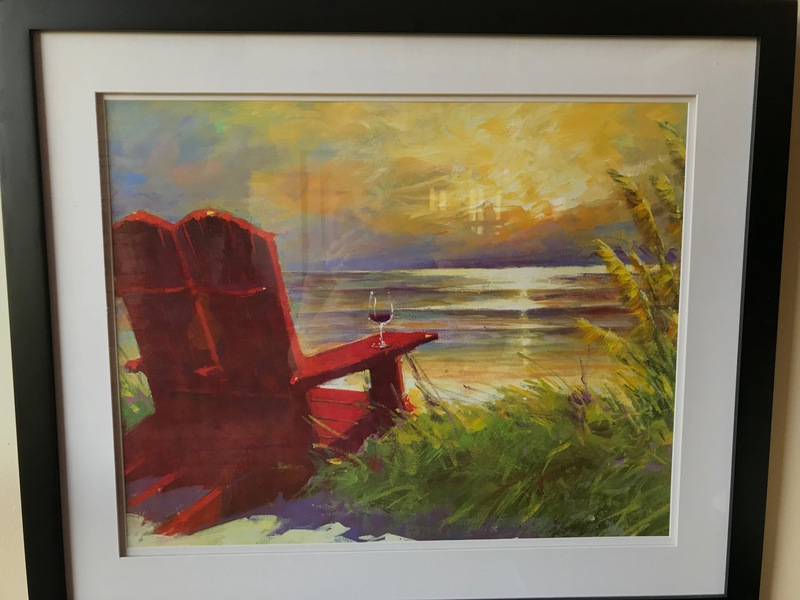 Featuring art greats, such as Pop artist, Peter Max, we knew we could not afford the magnificent art, but we always enjoy learning about the artists and attending the auctions. Plus, they serve champagne! 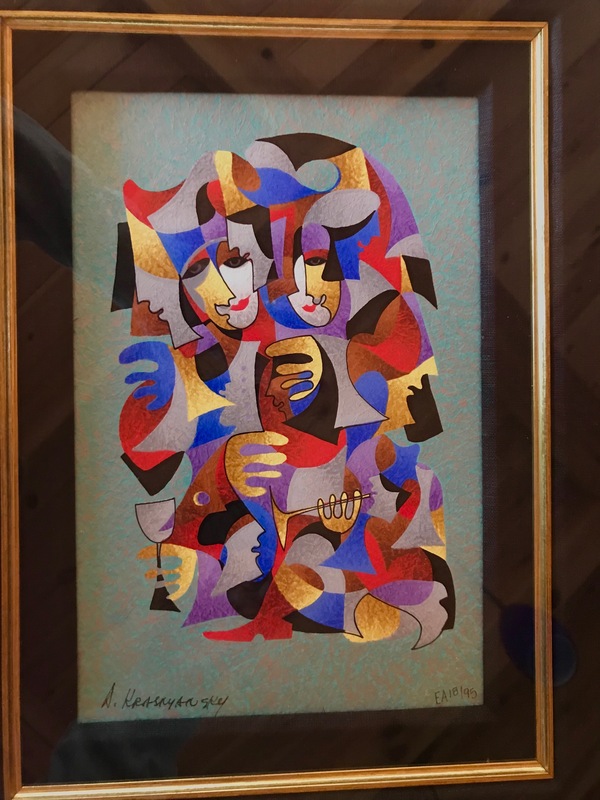 One of our two serigraphs by Anatole Krasnyansky. On a previous cruise we attended an art auction and learned a great deal about art styles and eras. During one auction, I stepped out to the restroom and returned for Jack to tell me he had purchased two paintings in a mystery auction while I was gone. 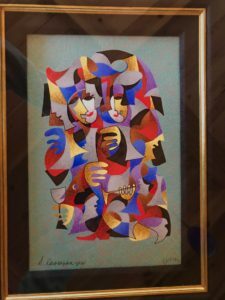 They are by Anatole Krasnyansky, a Ukrainian artist who depicts expressive surreal figures in cubism. 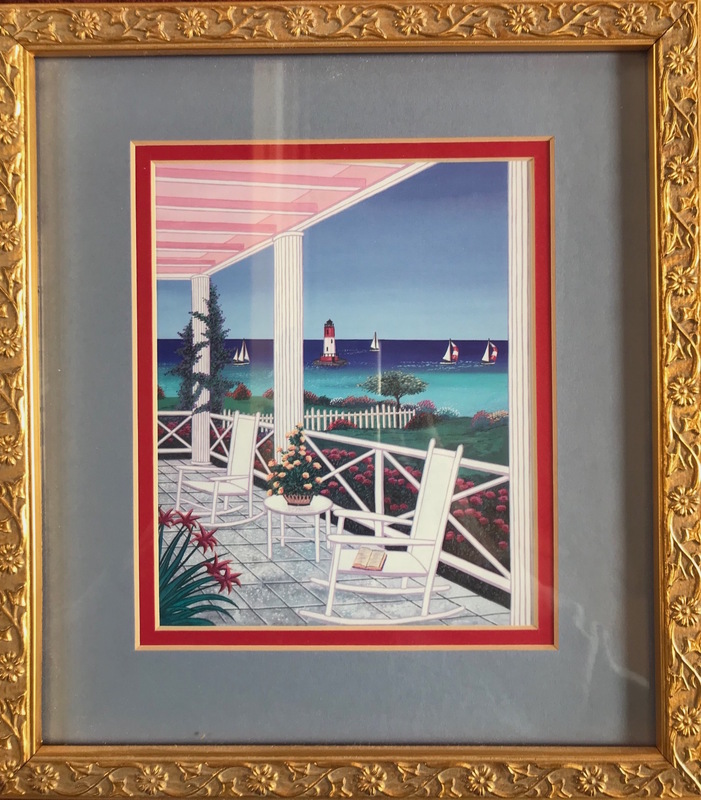 We have kept these two serigraphs in our personal quarters but have decided that we need to bring them into the light for others to enjoy. The first wedding anniversary is the paper anniversary. 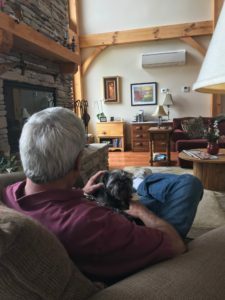 As an anniversary gift, I gave Jack a gift certificate to a Bed & Breakfast. He gave me a print by Emile Bellet. We had learned about Bellet’s work on the same (as above) cruise in about 2006. I love his style. His paintings often center on a mysterious figure, representing a timeless and ageless femininity. Jack always says it seems like he can’t paint faces. On the contrary, I think there are no features painted so that any woman can visualize herself in his paintings. Bellet says he represents “all women” in his paintings. Park West describes Bellet as a self-taught artist who has aligned himself with the discipline of the Fauves—a school of artists who lived at the turn of the 20th century that includes Henri Matisse, and Paul Cézanne. Bellet, born in Provence, France in 1941 has mastered painting in a vivid non-authentic color with an impasto knife, using highly saturated colors to paint his elongated mannerist forms. He began to paint at five years old and, by the age of 19, he held his first exhibition in 1960. When he was only 12, Bellet won first prize in a national art journal. 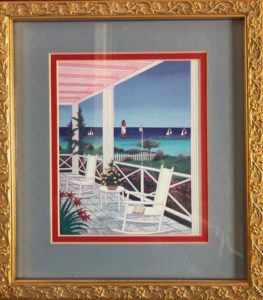 In 2006, Ebay and Amazon were still emerging industries so I w ent online to try to locate an affordable print of another favorite artist we had learned about on our cruise. Fanch Ledan creates imaginary scenes of exotic destinations. He calls these “interiorscapes” and they remind me (again) of many of the indoor-outdoor living spaces at the lake. 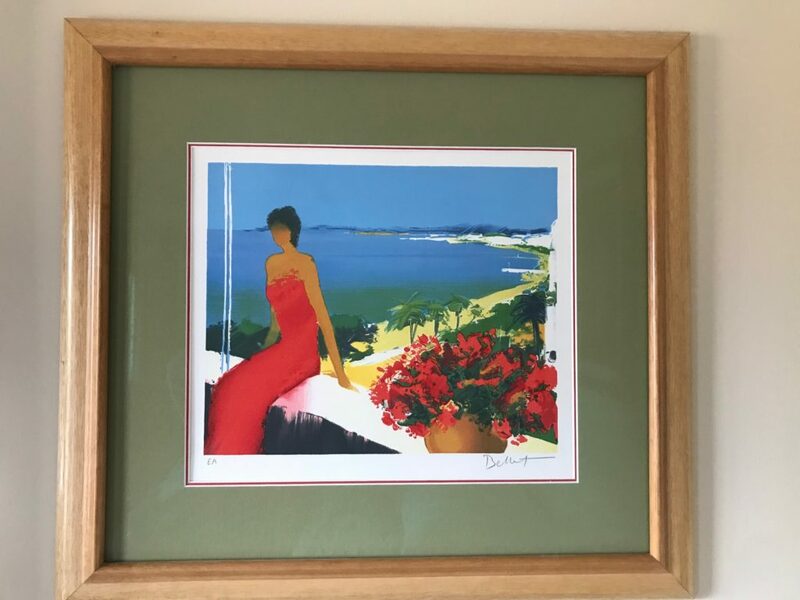 Our small piece that I snagged on E-bay allows us to join other well-known art collectors such as Jacques Cousteau, Jack Nicholson, and John Williams who also collect his art. This brings us to 2018. 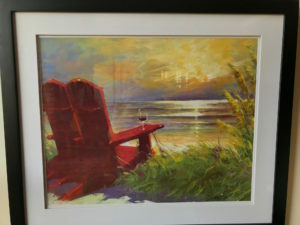 During the recent cruise, we attended both of the “day at sea” art auctions. We had our eye on a beautifully brilliant painting by Slava Ilyayav. It just seemed to light up the room! The original was well over $1000 but there was a serigraph on wood with original artist paint enhancements making it appear 3D. Entitled “Autumn Lane” it just spoke to us. The dealers tried to sell it to us for $750 then offering it at $500 but it was still out of our price range. As I mentioned above in speaking of Krasnyansky, Park West auctions often offer mystery bid deals. Late in the auction, they hold a mystery bid. They turn all of the art backwards on the easels. They then ask who is interested in bidding. At that point all you do is indicate that you may be interested in bidding. There is no loss to just indicate you WANT to bid. So I did so by holding up my bid number. Then they strike the gavel, do the reveal. And there it was. 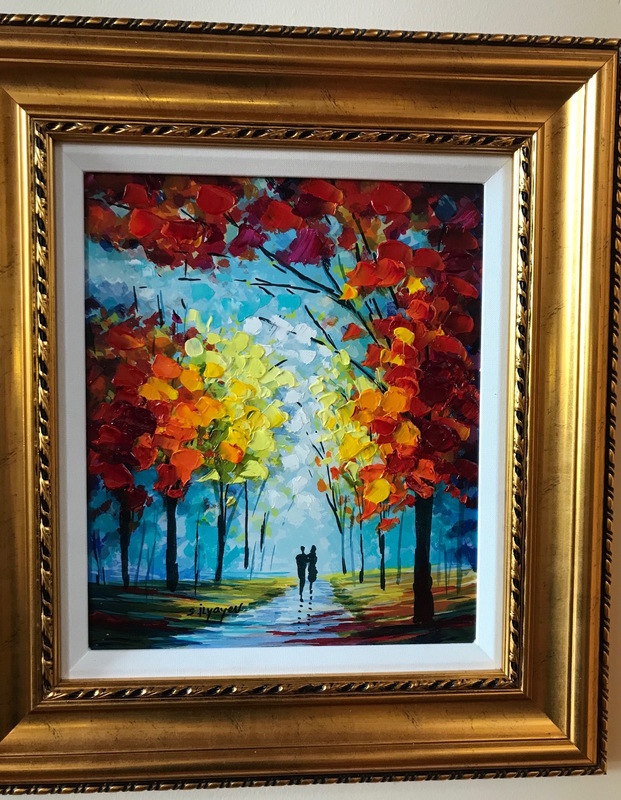 “Autumn Lane” by Ilyayev was one of the pieces featured on the easels now offered for $250. The auctioneer looked right at me with a pleased look on his face and…Oops- there went my number in the air! Sold! At this point we endured a round of applause knowing that we still could opt out if we were unsure. But we purchased it! It was shipped to us last week. We love it and it now adorns the great room in its brilliant happiness! Park West Galleries indicates on their website that the Autumn Lane artist, Slava Ilyayav is a master of the palette knife. Ilyayev creates colorful and vivid works that “carry on the traditions of Post-Impressionists like Vincent van Gogh into contemporary times.” The art of Ilyayev immerses viewers in a pleasant world of warmth, energy, and light. His art is exemplified by swathes of color raised above the canvas, resulting in textured compositions that transform nature into an exciting, joyful, and vibrant force. Slava Ilyayev was born on May 11, 1970 in Baku, Azerbaijan (formerly part of the U.S.S.R.). That same auction where we were enjoying “Autumn Lane,” our bid number was drawn for a door prize! We thought about Smith Mountain Lake when we saw this scene. Entitled “It Gets Better” by Marko Mavrovich. It is a seriolithograph. Marko Mavrovich was born in 1960 to Croatian parents li ving in California. At age 10, his parents moved back to Croatia with him. The beauty of the Croatian sea and coastline inspired Marko to begin sketching. With the support of his father, who was a watercolor artist, and his mother, his strongest critic, Marko honed his artistic abilities. During the summers, Marko sold his drawings to German and Italian tourists. At the age of 17, he started to attend an art school. Our Mavrovich print also is now proudly displayed in our Great Room. Mind you we were on a 12-day cruise and by now Park West staff was greeting us in the ship corridors and sending us mail to our cabin door about ship specials. They had “our number,” so to speak, for sure! With one more day at sea there would be another auction. Jack had fallen in love with Venus Du Bain. I mean he could not keep his eyes off her! Illuminated under the gallery lights, she was a shining beauty by artist, Csaba Markus (pronounced Shaba). 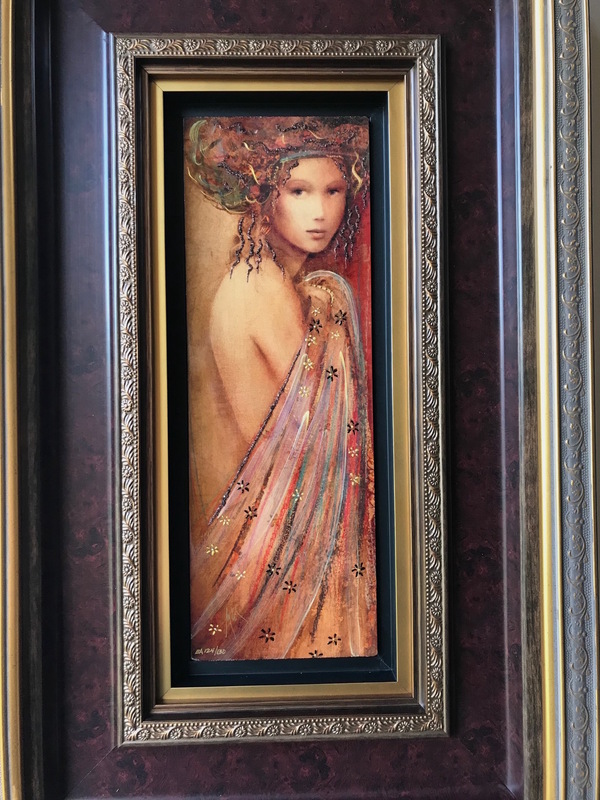 Evoking the elegance of Renaissance art, Csaba Markus masterfully combines Old World ideals and classical mythology with contemporary flair. Markus was born in Budapest, Hungary in 1953. Growing up in a Communist country, Markus found refuge in Europe’s art museums and baroque architecture. The aspiring artist became fascinated by the work of Renaissance artists like Michelangelo, Caravaggio, and Botticelli. These studies inspired him to draw and paint. Markus is best known for his “Modern Mona Lisas,” which combines ancient techniques with modern methods to create ethereal portraits of confident and mysterious young women. He uses a technique called Caldograph, which is a digital multiple on wood using dye sublimation, and involves many layers of colors and textures. Each piece is hand embellished by Markus himself with dried pigments, ground grass, and 24 carat gold. He uses a style called Sfumato, which is the technique of allowing tones and colors to shade gradually into one another, producing softened outlines or hazy forms (s in the Mona Lisa). Starting the bid at well over $2500, we passed on the Markus works time and again, each time as the gavel struck Jack was lamenting that he wished he could afford one. The gallery staff approached Jack telling him that they would go as low as $1500. We slept on it but knew that we would be crazy to indulge. The next day they told him that they had called their home office and would go as low as $800 and that was only if we opened a Park West credit account. We passed again after Jack told him the most he could afford was $500. After dinner that night, we were invited to a Park West exclusive art social so all of the art purchasers could meet each other. Ha! We went! That’s when they told Jack he could get the Csaba Markus for $500. After having thrown that figure out to them, he had to follow through. Venus Au Bain arrived this week superbly packaged by Park West and requiring a Fed Ex signature. Now if Jack is not in the hangar working diligently on the RV-10, he is sitting in the great room with Venus! Oy vey! Jack admiring the Markus painting of Venus Du Bain. tell you what we know. In the meantime, I snuck this photo of Jack and Venus! It kind of cracks me up! What great choices adding a touch of class to the B and B! Great lessons on art learned at the same time! !